We've arrived at the final day of our Emeril's Favorites Contest! We're giving you one more opportunity to answer a question about Emeril's favorite things for a chance to win a Emeril™ by T-fal® slow cooker! Here's today's question: what is Emeril's favorite pastime? Leave your answer in the comments section below. We will continue accepting responses to all contest questions, which you can find here, through the end of today. Good luck! 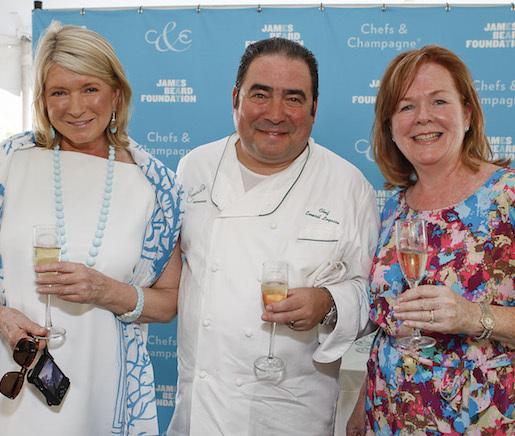 We hope to see you at tomorrow's Chefs & Champagne® New York, where we'll be honoring chef Lagasse for his contributions to the culinary arts. Official rules: Starting Monday, July 18, the James Beard Foundation will ask one trivia question about Emeril Lagasse each day, concluding on Friday, July 22, with a total of five questions being asked. Answers may only be submitted in the form of a comment in the comments section of Delights & Prejudices. Any commenter who correctly answers at least one of the five questions will be eligible to win. Comments containing correct answers submitted in response to any of the five questions by 12:00 A.M. Eastern Standard Time on Saturday, July 23, will be eligible. Comments submitted after 12:00 A.M. Eastern Standard Time on Saturday, July 23, will not be accepted. No purchase necessary. Purchase will not improve chances of winning. All winners must be 21 years of age or older, unless otherwise stated and/or posted. Only entries from within the continental U.S. will be considered. The winner of the contest will be chosen at random from comments received. The winner will be announced on Delights & Prejudices on Monday, July 25. The James Beard Foundation is not responsible for and will not consider incomplete or incorrect entries, or entries submitted but not received by The James Beard Foundation for any reason, as potential contest winners. Winners of all contests will be contacted at the email address that was submitted to Delights & Prejudices in order to comment. The person receiving and replying to the winner announcement email will be considered the winner. The James Beard Foundation or the supplier of the prize will mail the contest prize to the address supplied by the recipient of the winner announcement email. Claiming of prizes requires an email response to the James Beard Foundation from the winning sender email address within 14 days of being notified of winning at the email address used to enter. Failure to respond shall mean that the winner forfeits the prize. The James Beard Foundation will randomly select a new winner if the original winner fails to respond. Only one entry per commenter in response to a question will be considered for contest entry, unless multiple entries are specifically allowed in the contest posting. Unless otherwise specified in an individual contest post, no person may enter any contest more than once using multiple email addresses. Winners are solely responsible for all taxes and/or fees that may be incurred. Each prizewinner must supply the James Beard Foundation with his/her legal name, mailing address, birth date, daytime telephone number. At the sponsor’s discretion the winner must complete an affidavit of eligibility and liability publicity release. The decisions of the sponsor are final and binding. Winners may not request substitutions of prize winnings. All winners are solely responsible for any and all taxes and/or fees, and all such additional costs that may be incurred. Neither the James Beard Foundation, the James Beard Foundation sponsors, nor employees of the James Beard Foundation or sponsors may be held liable for any warranty, costs, damage, injury, or any other claims incurred as a result of usage of any winners of a prize once winner has taken possession of the product. The James Beard Foundation is not liable for any loss arising out of or in connection with or resulting from any contest promoted by the James Beard Foundation. Management, employees and families of the James Beard Foundation are prohibited from winning any prizes awarded by the James Beard Foundation.